From Meredith to Mommy: Points for Trying? 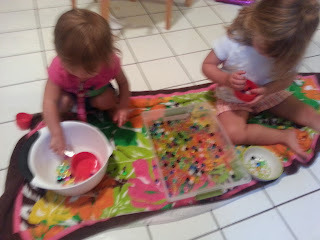 On this rainy day, I decided to pull out a fun sensory activity to keep the girls busy. 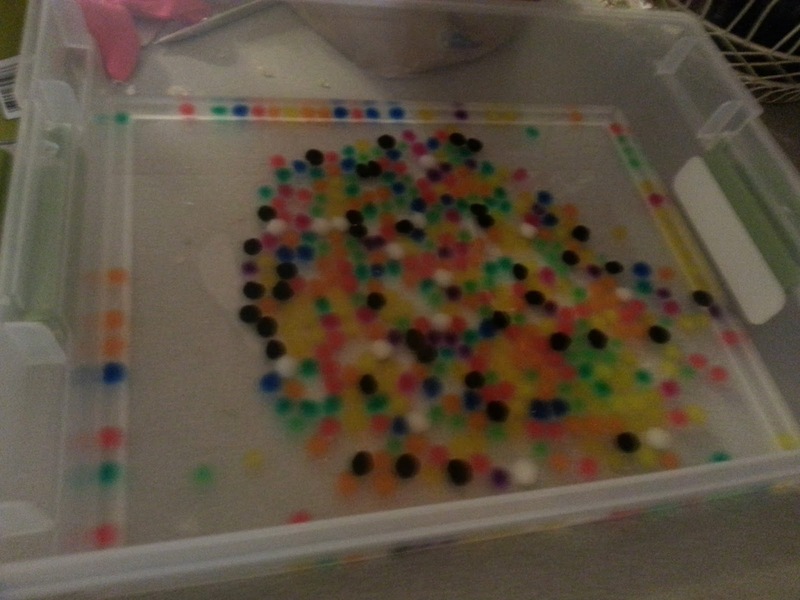 We "grew" water beads to play with. Madison has played with water beads before, but so far every time I've "made" them the night before. I decided we could do a little experiment making them together. It started out wonderfully and ended...well, you'll see. We started with a test tube of tiny beads. Reagan had absolutely no interest in this part of the project. I intended to have her help, but she wandered off. Throughout the entire growing process she showed very little interest - probably because it was mostly a "just look" situation. 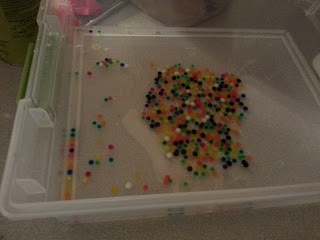 Madison poured the beads into the container and described them as teeny tiny. She thought the container was much too big for them. 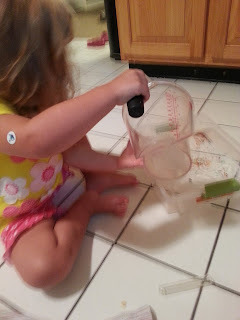 She poured in a measuring cup full of water. She told me the tiny specks were swimming. 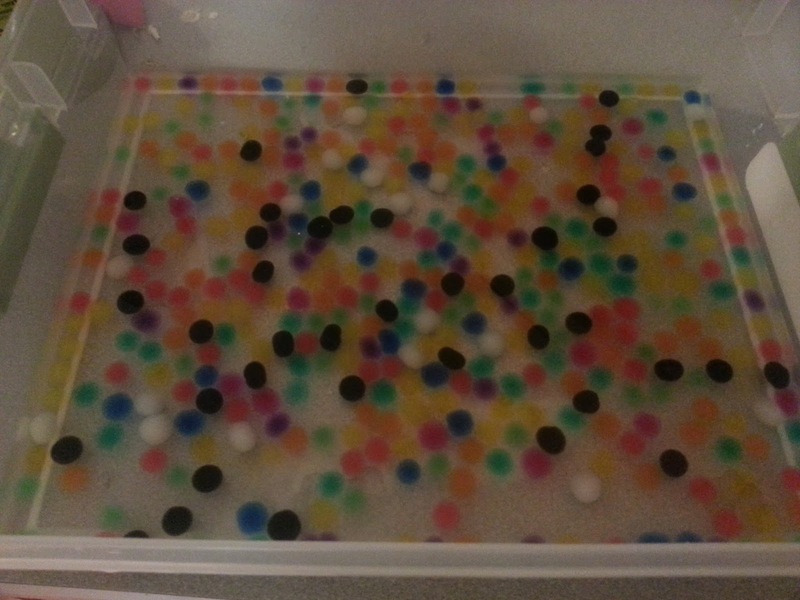 We noticed there was a lot of water and the color balls were little. Then we left them to grow. Madison was thrilled with the development and loved moving her hands around the container. They were squishy and slimy and slippery. Through all our activities, she always remembered to run back and check on them. Play with playdough? 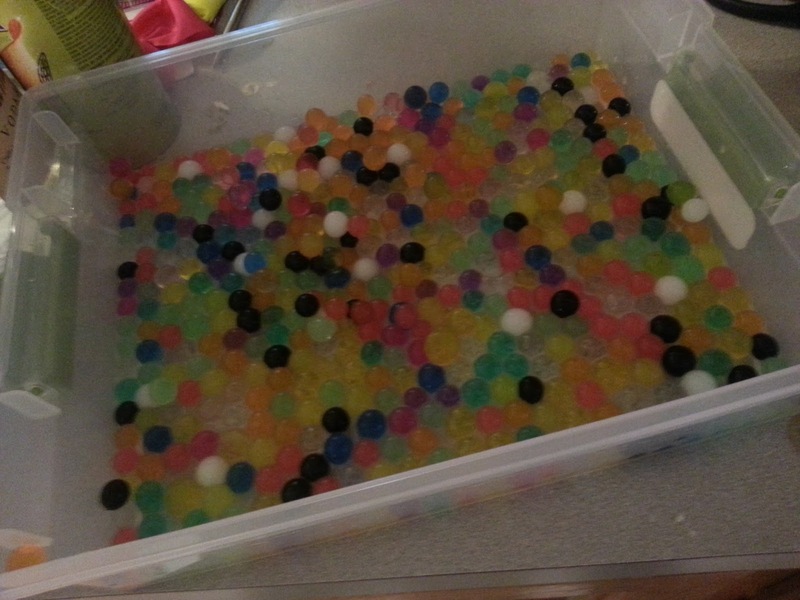 Check the beads first. Play with tools? 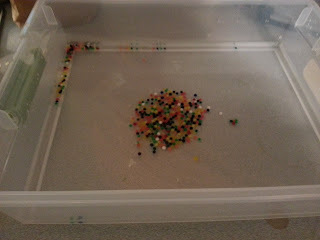 Check the beads first. Finally, by dinner, Madison decided they were big enough. Reagan was occupied with dolls in the family room, so I had Madison play with them on the kitchen floor while I was cooking dinner. She scooped, she poured, she took her little fish and let him go swimming. 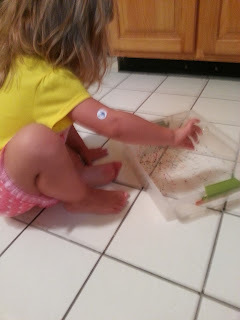 Then Reagan wandered in and wanted to get in on the sensory play. I took a break and sat down to play with her. She's a little young for these. They aren't toxic, but they still aren't intended to be eaten, because they can be a choking hazard. Reagan is mostly past the oral fixation stage, but that doesn't mean she won't taste something new. She aimed for her mouth once, I told her "not for eating" and took her hand away. She went happily back to scooping and pouring. However, every time she thought I wasn't looking, she'd aim for her mouth and laugh hysterically when I took her hand away. 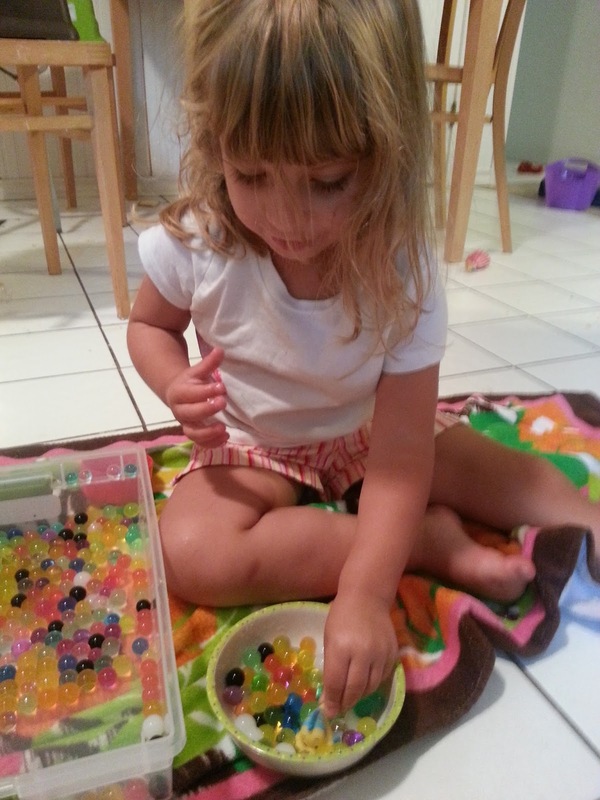 Not a problem - I am certainly involved with most of Reagan's sensory play. Except...remember what I was doing? With pots and pans and timers and boiling and things that needed my attention. Obviously, I couldn't leave Reagan unsupervised, and dinner needed to be finished and attended to, so I told the girls that water playtime was over until after dinner, and sent them back to the family room. Madison ran happily back to the toys. Reagan proceeded to have the tantrum to end all tantrums. She flailed and kicked and screamed the entire time until dinner was ready. 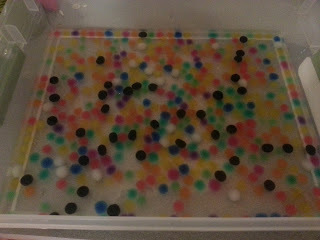 Good idea - watching water beads grow, learning that they "drink" the water, great sensory play. Bad idea - introducing them to a toddler when I had no business trying to split my focus. Moral of the story - when doing an all day project make sure a) you allow yourself time to actually finish it and b) everyone "around" you at the time can participate. Do I get points for trying? If you're interested in doing play with water beads, you can find them in the floral/craft section of Wal-Mart. I actually found these at Big Lots. 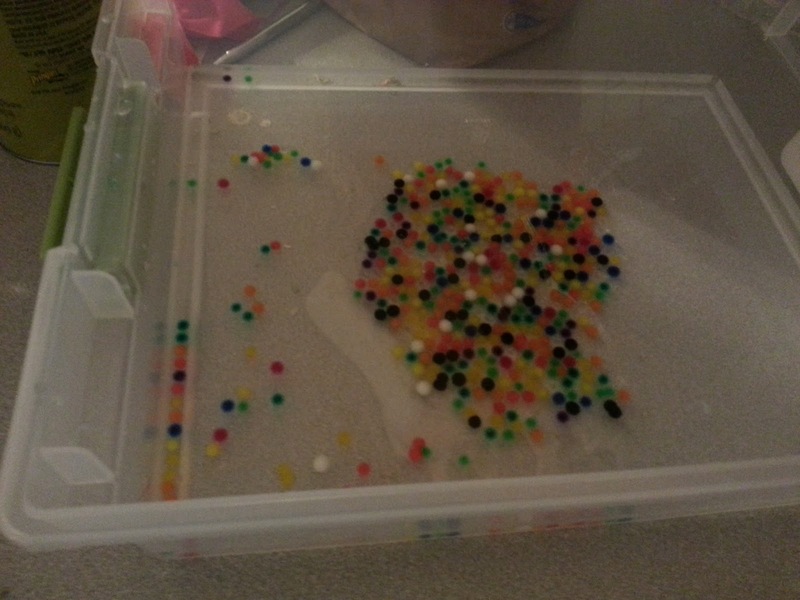 I was happy to find multicolored ones. 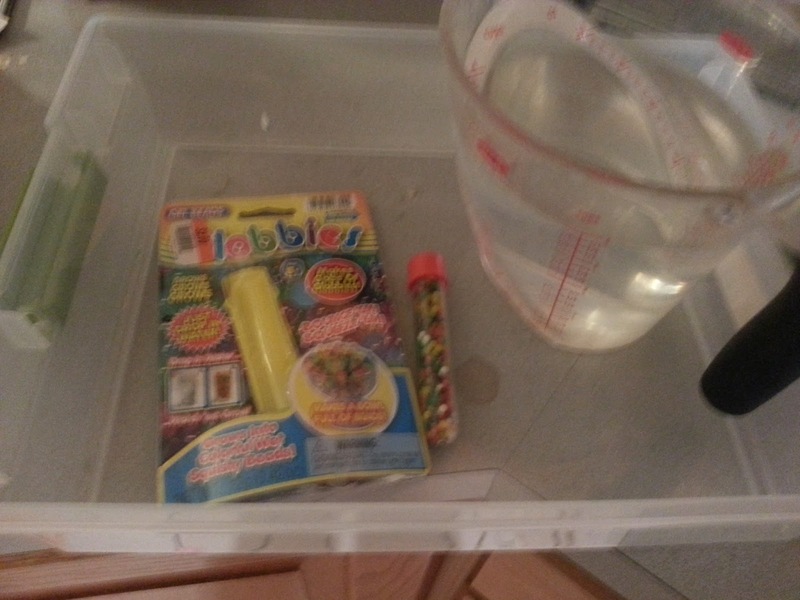 They will keep as long as you keep them in water, and will shrink back down as they dehydrate. If you have pets or small children, just be aware that they are not supposed to be eaten. I did realize after we started that warm water works more quickly, so if you want to avoid a dinnertime meltdown, that may be a good strategy.